I hope you enjoy this info. July, 2004 - After speaking with over a dozen passengers who had just stepped off of the Pride of Aloha, I found a mixed bag of comments. This was the first major cruise this ship had made with its new all American crew. News reports have commented that the ship has been experiencing staffing problems. Read about my one night "Cruise to Nowhere"
Passengers who had previously taken cruises on foreign flagged ships were somewhat disapointed with the cruise. Those new to cruising seemed to be less critical. Biggest complaints had to do with money; passengers felt they were being charged for on-board items they shouldn't have to pay for. They gave the REQUIRED $10 per person per day "service charge" as an example. 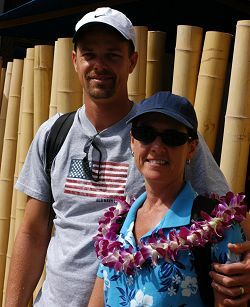 One couple was very upset when they discovered that the fees NCL charged for a helicopter excursion on the Big Island were much higher than the prices they found posted when they arrived at the airport. Comments regarding the Pride of Aloha's food were mostly "OK". Most were dissapointed in the buffets, found meals in the main dining room acceptable, and room service selections to be very poor. Those who ate in the "themed" restaurants, at added cost, found better service and food. Passengers enjoyed the entertainment, but several said they missed shows while waiting 2-3 hours to be served dinner in the main dining room. Passengers who booked cabins for 3-4 found the room design to be very poor. It was impossible to reach the bathroom without climbing over beds. Pre-teen kids seemed to have fun taking advantage of the ships kids programs. Teenagers seemed to be have had a horrible time. But when asked why they couldn't pin point why. I think it is just a "teenager" thing. Positive comments were usually the result of excellent service from specific room stewards. Most enjoyed the Hawaiian Island cruise itinerary and would tell others to do it, but said they would not recommend NCL's Pride of Aloha. Most said they plan to return to one of the islands they had visited on the cruise, usually Maui or Kauai. My hope is that NCL will improve the situation on the Pride of Aloha. But some of these complaints seem to be built into the way NCL does business. I had heard surprisingly similar complaints from those who had sailed on other NCL ships. I'll update this article after the crew has had a chance to improve. See more photos of the Pride. 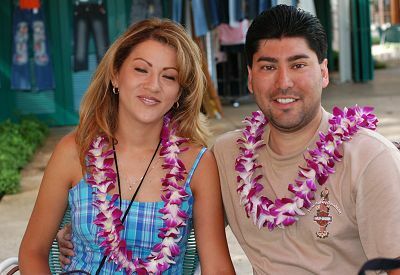 June 02, 2004 - This couple from Boston said the cruise was very nice, but they heard lots of other passengers complaining. They said it was sometimes difficult to find service staff. After a quick morning tour of the Arizona Memorial they were off to the airport and home. June 02, 2004 - The Holmes from San Diego get ready to board a taxi to a hotel in Waikiki. They have added several more nights onto their vacation. They would like to return to Kona at some point in the future. While in Hilo they rented a car and explored the area and would suggest others do the same. 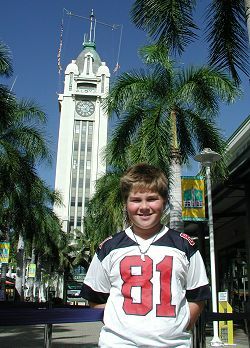 June 02, 2004 - Taylor Klisiewicz, 12, of Davis CA enjoyed the cruise on the Pride of Aloha, but his little sister seemed to have a better time taking full advantage of the Kids Corner on-board day camp. He was part of a group of 13 passengers who where celebrating this Grandparents 50th wedding anniversary. His dad was surprised by the added cost of dining at the "boutique/theme" restaurants. But overall he felt his group got their money's worth. Dad also found the Islanders they met to be incredibly friendly. Members of the group have already decided to return to Maui at some point in the future. Another member of the group recommended the "zip line" excursion on Kauai, skip the one on Maui.